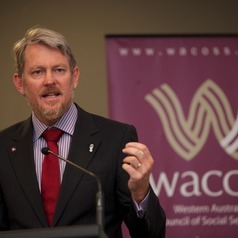 Chris is the Leader of Policy Development and Research at the Western Australian Council of Social Service (WACOSS) and a Senior Industry Fellow with the Bankwest Curtin Economic Centre. His primary expertise is in public policy advocacy in human service development and vulnerable consumers. Chris leads a small policy team undertaking advocacy focused on the needs of disadvantaged and vulnerable West Australians and the effectiveness of the services that support them. He represents consumer interests and vulnerable groups on a number of advisory forums, spanning issues from national energy policy, to affordable housing, to at-risk children and young people, and is the Chair of the Green Institute. Chris has a wealth of experience in industry, government and community engagement at both State and Federal level, with previous experience as a senior policy advisor to federal parliamentarians, a communications specialist in sustainable agriculture and natural resource management, in tertiary education of Aboriginal people, and educational multi-media. He is currently undertaking a PhD with the John Curtin Institute of Public Policy looking at social investment, early intervention and child safety.